Umbilical cord blood and tissue are rich in powerful stem cells that can only be collected at birth for potential future use. Why are stem cells powerful? Stem cells are powerful because they have the ability to create and regenerate the organs, blood, tissue and immune system that make up our bodies. They have the function of growth and healing throughout life. Stem cells can be found in places like bone marrow and fat tissue, but the younger, more flexible stem cells in the body come from a newborn’s umbilical cord blood and tissue. As an important source of such potent stem cells, umbilical cord blood and tissue may be stored for potential future use. 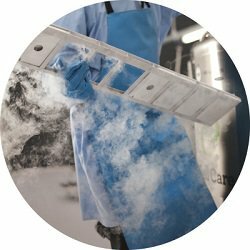 Why store cord blood and tissue stem cells? Cord blood stem cell transfusions are currently being used in place of bone marrow transplants for many life threatening conditions such as blood cancers (e.g. leukaemia), immune system and metabolic disorders. In addition to its relative potency, when used in treatment cord blood stem cells are less likely to cause problems in transplant because of their youth and flexibility. The properties of cord blood cells mean they can more easily integrate into a patient’s body. Worldwide, cord blood has been used in over 40,00042 transplants in the treatment of over 80 conditions43. Your baby’s umbilical cord stem cells are a perfect match for your child, and are more likely to be a match for siblings. This is known as family cord banking. In addition to the 80 treatable conditions today, there is a vast and expanding range of new therapies being researched that anticipate using cord blood and tissue in the future; e.g. type 1 diabetes, cerebral palsy and spinal cord injury27. Click here to learn more about cord blood and tissue clinical trials and research.